Bromocriptine (also known as Parlodel) is an antiaging supplement designed to increase dopamine, which is essential for brain activity. It has also been shown to improve glucose tolerance and improve insulin resistance, making it useful for the treatment of Type-II diabetes. Plus, there has been some research in to Bromocriptine and weight gain as it is believed to help regulate metabolism. Bromocriptine is a semi-synthetic derivative of the ergo group, which is known to increase dopamine levels in the brain. It is used to delay age-related mental decline, but it also useful for people with Type-II diabetes as it can improve glucose tolerance and improve insulin resistance. Studies on animals have also suggested the potential for Bromocriptine and weight gain control due to its ability to affect the central nervous system. Bromocriptine can be used to treat various age-related conditions. It can increase dopamine, improve glucose tolerance, and it is commonly used to treat disorders arising from excessively high blood levels of the hormone prolactin. Prolactin is one of the few hormones that actively increases as we age. It is produced by the pituitary gland, and is often referred to as a fat synthesis hormone, as it triggers lactation and weight gain in pregnancy. Bromocriptine Prolactin has been used to help restore ovulation in women and it can both increase Growth Hormone (GH) levels in people with normal concentrations, as well as suppress GH secretion in those suffering from excessive GH production in their bodies. How does Bromocriptine Prolactin work? Dopamine is a key neurotransmitter in the brain that declines as we get older. Dopamine levels in the average healthy person are estimated to decline by approximately 13% per decade over the age of 40. Abnormally low levels of dopamine are associated with mental degenerative conditions such as Parkinson’s disease. Some neurologists warn that if we continue to increase life expectancy as we are currently doing, we will all be senile! Enhancing and protecting dopamine-producing neurons has, therefore, become a key focus of anti-ageing researchers. Bromocriptine Prolactin works by stimulating dopamine receptors in the brain. It also slows down the production of prolactin, which is a hormone released from the anterior pituitary gland. Prolactin is one of the few hormones that increase as we get older, and high prolactin levels are associated with mental degenerative conditions. Prolactin is also connected to abnormal breast milk production, and suppression of the sexual glands, which can result in infertility. Scientists also believe that prolactin plays a significant part in suppressing the immune system. What is Bromocriptine useful for? Bromocriptine is primarily used to treat mental degenerative conditions, such as Parkinson’s, but it is also a powerful preventative medicine for people wishing to delay age-related mental decline. Bromocriptine has been indicated in the treatment of Type II diabetes, due to its ability to suppress lipogenesis and improve glucose tolerance and insulin resistance. It has also been proven to alter the CNS (central nervous system) regulating metabolism, and so can be used to prevent weight gain. Clinical studies on rats have also suggested that Bromocriptine is a potent free radical quencher. In the studies, rats were given a component of tobacco called DMBA to a level that was likely to induce breast cancer. However, rats that had been pre-treated with Bromocriptine avoided contracting cancer. Bromocriptine and breast cancer prevention have, therefore, also been linked. Bromocriptine is a very potent supplement that should not be used by pregnant or lactating women, unless under the guidance of a doctor. Side effects may include nausea, dizziness, lowering of the blood pressure, hypotension and confusion. Dosages should not exceed 1.25mg or 2.5mg daily for most people. Bromocriptine is used to treat many different conditions, but it is particularly recommended for anyone seeking to delay age-related mental decline. It is a powerful antiaging medicine that works hard to rejuvenate your body and brain. My reason for taking bromocriptine was because of its action as a free radical scavenger, I found that it had an additional beneficial effect. I have had tinnitus for many years. I found to my surprise and delight that bromocriptine stopped the ringing. I did a literature search for bromocriptine and tinnitus – coming up with an interesting article that suggests dopaminergic pathways are related to tinnitus. See Medical Hypotheses, 2005,65, 349. Bromocriptine is also a vasodilator, and we were wondering if you had ever tried that approach before, i.e. something like vinpocetine- without avail? But it is most interesting to learn that in this case bromocriptine could have been responsible for alleviating your tinnitus. We appreciate you letting us know. Bromocriptine is a very potent substance and it must not be used by pregnant or lactating women, unless under the guidance of a physician. Bromocriptine does contraindicate with psychoactive and hypotensive drugs and other Dopamine enhancing drugs, such as Cabergoline, Deprenyl and Sinemet ® CR. Although often dependant on the dosages used, these should only be administered concurrently under a physician’s guidance. Its effects can also be exaggerated when combined with other ergots, including Hydergine and Nicergoline. Bromocriptine, also known as Parlodel, protects the brain from dementia and similar conditions by helping increase and maintain dopamine levels. The chemical dopamine is crucial to our brain function. As we age, dopamine levels drop. This can trigger various cognitive illnesses, such as Alzheimer’s disease, which can be directly linked to the ageing process. Uses have extended beyond this life-enhancing treatment, however. Bromocriptine diabetes tests have shown that symptoms can be alleviated with regular treatment of the drug. Links have also been made between Bromocriptine and sleep disturbances, several types of which have been modulated in clinical trials by administering Bromocriptine. The recommended dosage of Mylan Bromocriptine may vary depending on the condition it’s being used to treat, and side effects can include nausea, dizziness, or hypotension. If any of these occur, simply lower the dose of Bromocriptine and consult a physician. Colloidal silica, magnesium stearate, polyvinyl pyrrolidine, corn starch, lactose. Boxes containing 30 2.5-mg tablets, to be taken by mouth. Prolactin secretion inhibitor with dopaminergic effect. Galactorrhoeaaccompanied or not by amenorrhoea; post-partum effects (Chiari-Frommel); idiopathy (Aragonz-del Castillo); tumoral effects (Forbes Albright), side effects from pharmaceutical products (psychotropic and contraceptive drugs). Prolactin-dependent amenorrhoeawithout galactorrhoea. Hyperprolactinaemic infertility. Menstrual disorders(premenstrual syndrome, brief luteinic phase). Prolactin-dependent male hypogonadism. Acromegaly:The initial treatment for this problem is surgical or by means of radiotherapy. PARLODEL is a useful adjuvant in either treatment and may be used without them in certain cases. Idiopathic and arteriosclerotic Parkinson’s disease.PARLODELis particularly beneficial to those patients who show a decreasing response to L-dopa, and in cases where the effects of levodopa therapy are restricted by the presence of the “on-off” phenomenon. Taking this product with L-dopa brings about an increased anti-Parkinson effect which permits a lower dosage of both pharmaceutical products. PARLODELcan be taken on its own in preliminary or mild cases of Parkinson’s disease and may also be taken with anticholinergic drugs and/or other anti-Parkinson products. If you are expecting a baby or think that you might be, it is unwise to take this product. The safety and effectiveness ofPARLODEL(bromocriptine mesylate) has not been confirmed for treatment of adolescents younger than fifteen years of age. In patients with galactorrhoea and prolactin-dependent amenorrhoea, menstrual disorders or acromegaly, PARLODEL may eliminate pre-existing sterility. Women who may become fertile but who do not wish to conceive should therefore adopt a mechanical form of contraception. The exact cause of infertility should be determined before beginning PARLODEL treatment. Pregnancy should be avoided if hypophysial adenoma has been diagnosed. A marked lengthening of the sella turcica or a defect in the field of vision requires, first of all, surgery or radiotherapy. PARLODEL is only recommended should these measures fail. In the absence of hypophysial adenoma and should the patient be anxious to conceive, PARLODEL treatment should be stopped as soon after conception as possible (early pregnancy diagnosis with immunological test) since knowledge of the possible effects of this pharmaceutical product on the development of pregnancy and the foetus is as yet inconclusive. As a precautionary measure in the case of confirmed pregnancy, the possible negative effects of a pathological hypophysial problem associated with the pregnancy should be controlled regularly (for example, checking the field of vision). Sporadic gastrointestinal bleeding has been known to occur in patients with acromegaly, whether they are undergoing PARLODEL treatment, another treatment, or no treatment at all. Until more complete information is available, it is thus preferable for acromegaly patients with case-histories of peptic ulcer to receive some other form of treatment. If it is essential that such patients take PARLODEL, they can soon expect signs of such gastroenteric reactions. 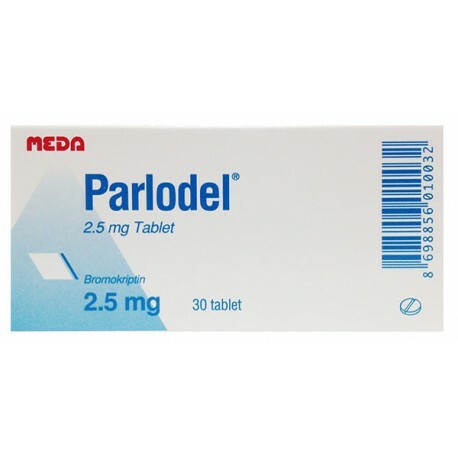 Caution is advised when PARLODEL is taken in large doses by patients suffering from Parkinson’s disease with case histories of psychotic disorders, serious cardiovascular problems, peptic ulcers or gastroenteric bleeding. Some cases of pleural effusions have been reported in Parkinson patients undergoing long-term high-dosage PARLODEL treatment. Although the causal correlation between PARLODEL and these reports has not been proved, it is still advisable for patients who show inexplicable pleuro-pulmonary signs or symptoms to be examined and the possibility of stopping PARLODEL treatment considered. The possibility of interactions between bromocriptine and psychoactive or hypotensive drugs should not be ruled out. Particular caution should be taken with regard to patients undergoing treatment with ergot alkaloids or products which might possibly increase arterial pressure. For instructions as to the use of this product during pregnancy or by patients with acromegaly and/or hypophysial adenoma, see “PRECAUTIONS”. Treatment must be carried out under medical supervision, including hormone dosage and gynaecological consultation. All women being treated with PARLODEL for a continuous period of longer than 6 months should have gynaecological check-ups once a year if they have not reached menopause, and every 6 months if they are undergoing menopause (with cervical and if possible endometrial cytology). Women with affections not linked to hyperprolactaemia should take the lowest possible effective dosage of PARLODEL to alleviate the symptoms, so as to avoid the possibility of lowering the prolactin level below normal with a consequent alteration of the luteinic function. Tests concerning plasmatic prolactin and post-ovulatory progesterone should be carried out on such patients if treatment is prolonged for longer than 6 months. In the event of hypotensive reactions, which can occur with certain patients especially during the first days of treatment, particular care should be taken when driving or operating machinery. This product is always to be taken at mealtimes. Galactorrhoea and/or prolactin-dependent amenorrhoea, hyperprolactaemic infertility: half a tablet 3 times daily. If this is not sufficient, increase the dosage gradually to 1 tablet, 2-3 times daily with meals. Continue the treatment until the mammary secretion disappears completely, and, should the problem be compounded by amenorrhoea, until the menstrual cycle returns to normal. The treatment may be continued if necessary for several menstrual cycles in order to avoid a relapse. Disorders of the menstrual cycle: Pre-menstrual syndrome. Begin treatment on the 14th day of the menstrual cycle with a half tablet per day, then gradually increase the dosage by half a tablet until reaching the dosage of 1 tablet twice daily. Continue this treatment until the onset of the menstrual flow. Brief luteinic phase. Half a tablet 3 times daily, gradually increasing the dosage to 1 tablet twice daily with meals until the luteinic phase has returned to normal. Male hypogonadism: half a tablet 3 times daily, gradually increasing to 1 tablet 3 times daily for a period of 2-3 months. Acromegaly:Start by taking 1 tablet per day, gradually increasing the dosage over 1-2 weeks to 4-8 tablets, according to the patient’s needs, clinical response and tolerance. The daily dosage should be divided into 4 separate and equal doses. Parkinson’s disease:The effects of Parkinson’s disease can be combated with low doses, 10-15 mg daily. 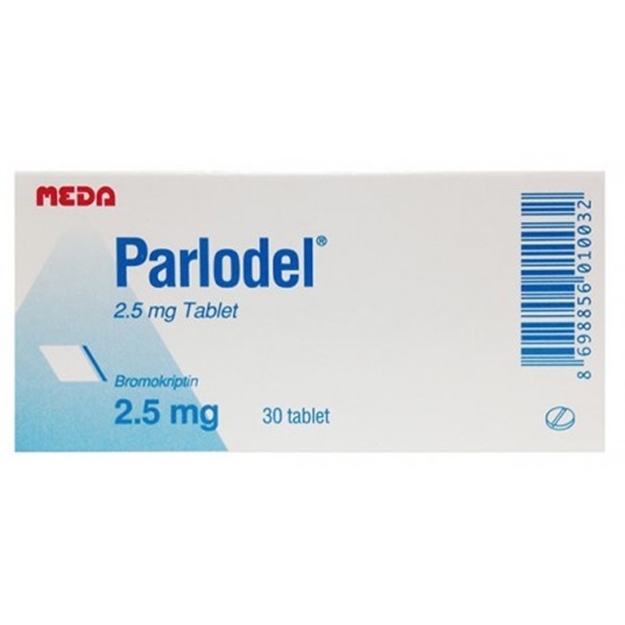 The effective therapeutic dosage when PARLODEL is taken alone is usually high (30 mg or more per day). However, if PARLODEL is taken together with L-dopa, with or without the dopa-decarboxylase inhibitor, a lower dosage may suffice. The recommended initial dosage is 2.5 mg twice a day (at mealtimes) for a week. The dosage increase must be gradual and regular: normally not by more than 5 mg every 2-3 days in the initial phase of treatment. Later on, the final dosage increase can be done gradually, not more than 10 mg at a time, depending on therapeutic response and tolerance. Similarly, each reduction of the L-dopa dosage must be gradual until optimum results are obtained. In certain cases L-dopa treatment may be stopped altogether. Cases of life-threatening overdoses have not been reported. The single maximum dose taken by an adult has been 225 mg. Nausea, vomiting, dizziness, orthostatic hypotension, excessive perspiration and hallucinations have been observed. Treatment of acute intoxication is symptomatic. Metoclopramide may be used for vomiting and hallucinations. During the first days of treatment, some patients may experience mild nausea and, less frequently, dizziness, fatigue or vomiting. However these side effects have never been of such an intensity as to require a suppression of treatment. In rare cases, PARLODEL may lead to a lowering of blood pressure. For this reason supervision and evaluations of out-patients are advisable during the early days of treatment. Should such undesired side effects persist, the dosage should be reduced. Reversible pallor in fingers and toes caused by cold should be reported in the case of patients undergoing a prolonged treatment of 20 mg and more, especially in patients who have previously suffered from Raynaud’s phenomenon. There have also been cases of vasospasm, hallucinations and confusion, hypotension and diskinesia. Constipation, drowsiness and, less frequently, psychomotor excitation, leanness of the jaw and leg cramp have also been reported during treatment of Parkinson’s disease with PARLODEL. At times certain dose-dependent effects may be controlled by a lowering of the dosage. Postural hypotension may be unpleasant but can be treated symptomatically. If, after taking this pharmaceutical product, the patient notes unpleasant side effects which are not described in this leaflet, he should consult his family doctor. Store this product out of the sunlight and at a temperature not exceeding 25ºC. Do not use this product following the expiry date.